In my mailbox on October 09th, 2012. Angkor Wat is the largest Hindu temple complex in the world. The temple was built by King Suryavarman II in the early 12th century in Yasodharapura, the capital of the Khmer Empire, as his state temple and eventual mausoleum. 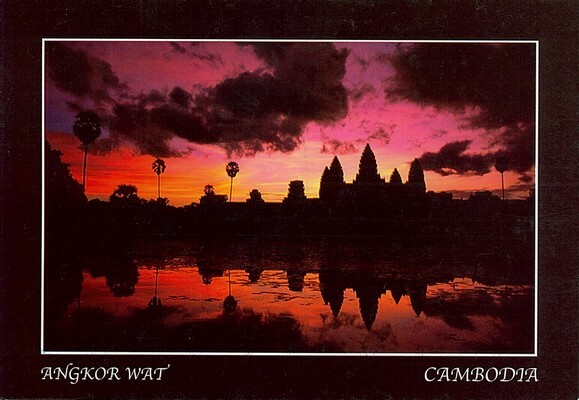 Breaking from the Shaivism tradition of previous kings, Angkor Wat was instead dedicated to Vishnu. As the best-preserved temple at the site, it is the only one to have remained a significant religious centre since its foundation – first Hindu, dedicated to the godVishnu, then Buddhist. The temple is at the top of the high classical style of Khmer architecture. It has become a symbol of Cambodia, appearing on its national flag, and it is the country's prime attraction for visitors.